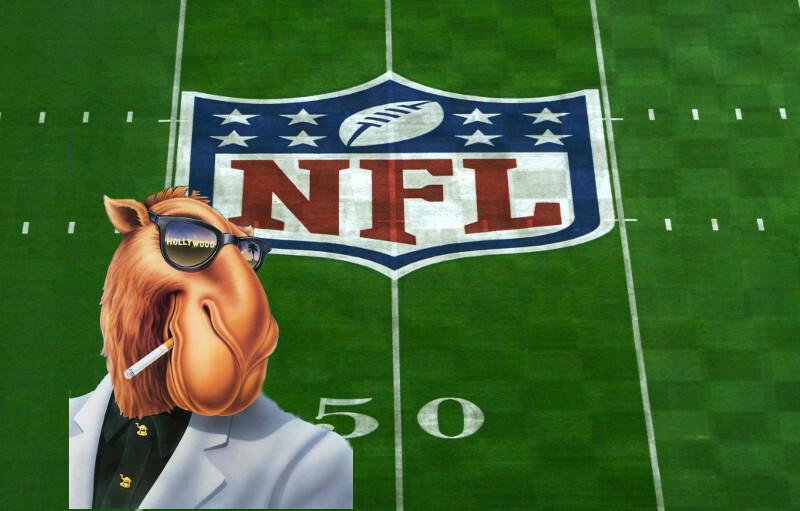 Will the NFL’s youth marketing spin be remembered in the same manner as Joe Camel’s tobacco pitch? Like many other American families, the Robinsons were a football family. They enjoyed the sport as spectators and felt the attributes of teamwork, leadership, and sportsmanship would benefit their son. And since more and more families were enrolling their preschoolers in football leagues, the Robinsons wanted young Adrian to have both the enjoyment and competitive advantages of an early start as well, so at the tender age of five Adrian entered the world of tackle football. From the beginning Adrian wore NFL endorsed Riddell helmets, that were purported to reduce risks of concussions as USA Football touted the safety of the game along with its benefits to unsuspecting children and their families. 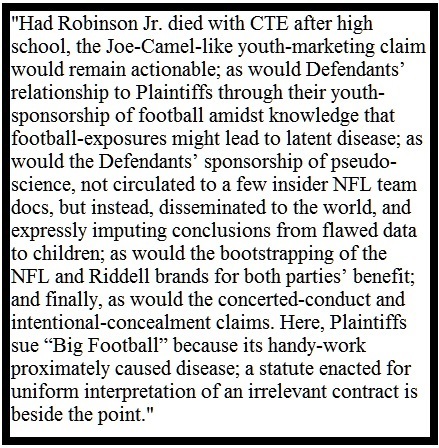 But unknown to the Robinsons, while Adrian “was still toddling in diapers the NFL and company decided to get into the business of ‘research.’” As stated in the Robinson’s lawsuit filed in May against the NFL and Riddell, “they established a committee on MTBI and used the NFL Charities to, ‘create self-serving pseudo-science on repetitive brain injury.’” The 97-page lawsuit details decades of deception and an intentional disinformation campaign that would ensure the league of future players without regard to the mounting evidence of the dangers of football related brain injury. Adrian Jr. began experiencing problems when he was only eleven years old. He was diagnosed with attention deficit disorder and placed on medications to control the symptoms. But instead of improving, his symptoms only increased. 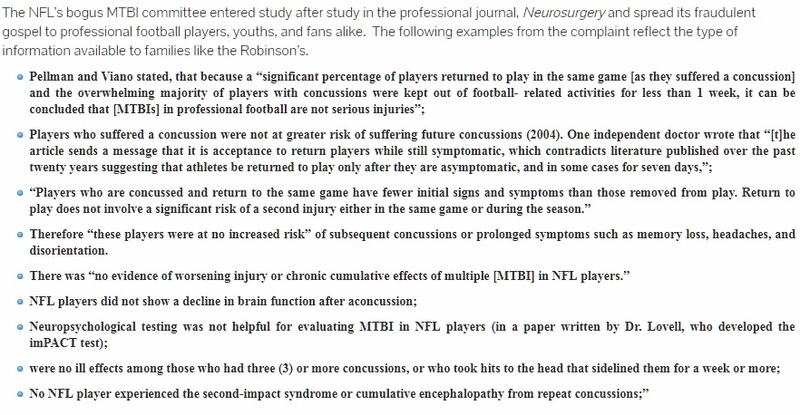 By the time he was 14 his pediatrician had documented significant neurocognitive and emotional problems including depression and concentration issues, along with frequent head and jaw aches but due to the NFL’s barrage of pseudoscience and disinformation Adrian’s problems were never linked to football exposure so he continued to play. 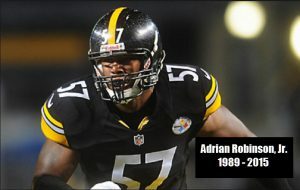 Adrian drew accolades for his ferocious gridiron performances in high school and college, and was signed by the Pittsburgh Steelers in 2012, which sadly seemed to be the beginning of the end for Adrian Jr. During his two years in the NFL he bounced between the Steelers, Eagles, Broncos, Charger and Redskins. During his time in the NFL Adrian sometimes had emotional outbursts on Twitter and often waxed philosophical. You don’t know how little you matter until your all alone. Now the child that will never really know her father, along with her mother and Adrian Jr.’s parents seek closure and accountability. Their lawsuit initially filed in the Court of Common Pleas of Philadelphia against various NFL entities along with helmet-maker Riddell and its subsidiaries is unique in that it doesn’t blame on-field injury management, or other player safety failures or even the NFL’s brutal return to play culture that Adrian experienced during his time playing in the NFL, but rather the toxic culture it fostered for children like Adrian, during the time preceding his professional football career. Shortly after the lawsuit was filed, the NFL defendants moved to have the litigation relocated to federal court and consolidated with MDL-2323, more commonly known as the NFL Concussion Settlement. As with almost all litigation in which the NFL is involved, the move to federal court is an attempt to invoke §301 of the Labor Management Relations Act (LMRA) which requires federal jurisdiction of disputes in which CBA interpretation is required. To date, this LMRA provision has provided the NFL with its most solid and air-tight defense since CBA provisions tend to be vague in regard to protections to players and written in a manner highly favorable to management. Brad Sohn, the attorney representing the Robinsons says this is irrelevant here. None of the plaintiffs or defendants in this lawsuit have ever been a party to the CBA. 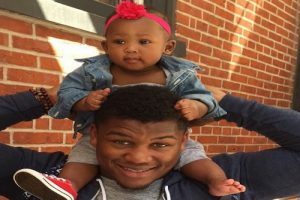 Adrian Robinson Jr., the decedent was but he is not a plaintiff. 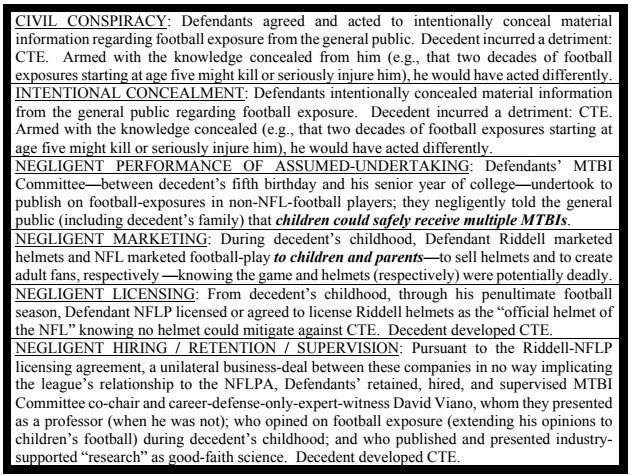 The NFL Management counsel is the only NFL party that is involved in CBA negotiation and implementation and they are not a defendant, but rather the marketing arm that crafted NFL PR spin and endorsed products such as Riddell helmets and the charities division which has made generous donations to fund deceptive research. This appears to be a particularly strong argument for the Robinson estate as well as potential grounds for future lawsuits from others influenced by and then injured by the NFL’s practices. The Defendants claim that the Robinson lawsuit mirrors that of Dave Duerson, whose pathology following his suicide also revealed CTE, but the Robinsons plead different claims. Whereas Duerson’s estate pled that the NFL failed to protect Mr. Duerson during his playing career, the Robinsons allude to deception on the part of the NFL which influenced Robinson’s family to allow his participation in football, and had the NFL not deluded them with a stream of disinformation Adrian would have likely never played in the NFL at all. For those uninitiated into the world of NFL litigation, state courts are generally a preferred venue when bringing a lawsuit alleging injury. State law tort claims are weighed against various laws that govern behavior and a case is generally tried on its merits. As such, the Robinsons lawsuit is a major departure from earlier lawsuits alleging misconduct on the part of the NFL by way of it’s treatment of players. Mr. Sohn has presented a novel and compelling argument as to why the CBA is not applicable in the Robinson case in his bid to remand the case back to its original venue. In my opinion this could be one of the landmark cases to watch in 2018. While one can never discount the NFL’s courtroom expertise, the arguments presented here are pertinent and gripping – and if the case is remanded to state court – could finally be the one bring the NFL to discovery and unleash a nightmare for the NFL that would make a the concussion settlement a mere pennies on the dollar proposition. That’s the big picture here, anyway. In the more immediate focus, it is hoped that this case will bring closure and some degree of comfort to a family who lost a son, a partner, and a father. All quotations are from the original complaint in the Adrian Robinson lawsuit or the Reply in Further Support of Plaintiffs’ Motion to Remand unless otherwise indicated.